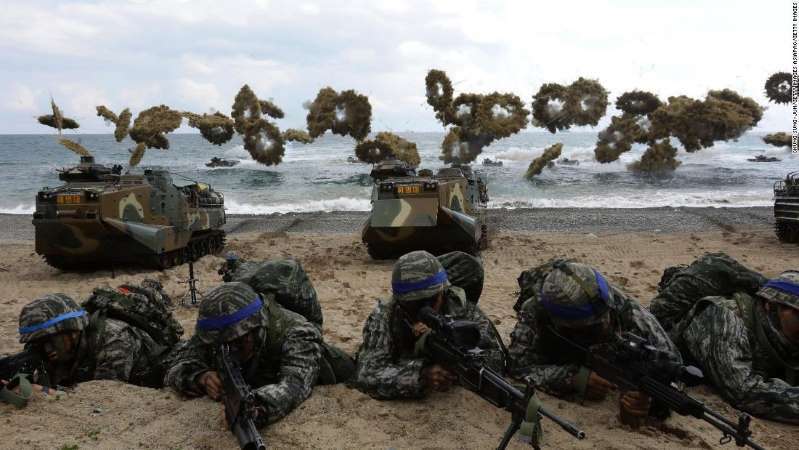 The US and South Korea decided Friday to suspend another major joint military exercise to give the diplomatic process with North Korea "every opportunity to continue." "Secretary of Defense James N. Mattis and Minister of National Defense Jeong Kyeong-doo decided to suspend Exercise Vigilant Ace to give the diplomatic process every opportunity to continue," chief Pentagon spokesperson Dana White said in a statement. The decision was made during Mattis' meeting with his counterpart in Singapore. The exercise was due to take place in December. Last year's iteration of the Vigilant Ace involved 12,000 US troops and some 230 military aircraft from the US and South Korea. President Donald Trump has long criticized US military exercises with South Korea, calling them expensive and provocative and suspending several major exercises following his June summit with North Korean leader Kim Jong Un in Singapore. "The President believes that his relationship with Kim Jong Un is a very good and warm one, and there is no reason at this time to be spending large amounts of money on joint US-South Korea war games. Besides, the President can instantly start the joint exercises again with South Korea, and Japan, if he so chooses," the White House said in a statement in August that was subsequently tweeted by Trump. Trump's pick to lead US troops in South Korea, Gen. Robert Abrams, told Congress last month that the suspension of the exercises had resulted in a "slight degradation" to the readiness of US and Korean troops but called the decision a "prudent risk" to improve relations with Pyongyang. White said Friday that both Mattis and his South Korean counterpart "are committed to modifying training exercises to ensure the readiness of our forces," saying "they pledged to maintain close coordination and evaluate future exercises." She also said that Mattis had consulted with Japan's Minister of Defense Takeshi Iwaya on this matter, and they reaffirmed their commitment to regional security.